Gophers guard Deandre Mathieu, who scored a team-high 13 points, outplayed Buckeyes guard Aaron Craft in Minnesota's 63-53 win on Thursday. MINNEAPOLIS — As Richard Pitino headed toward Minnesota’s locker room following Thursday’s 63-53 win over No. 11 Ohio State, a Gophers fan offered encouragement to the victorious coach. "Somebody yelled to me as I’m walking off the court, ‘Beat Wisconsin,’" Pitino said. "I said, ‘What about Iowa? They’re no slouch, certainly.’"
That’s the kind of excitement Pitino has brought to this fan base, one that had watched its team underperform in recent years. In his first season at the helm, the 31-year-old Pitino has transformed this Gophers program into one that can compete with any team in the Big Ten. Minnesota’s players have certainly believed all year that they stacked up with the likes of the Ohio States and Wisconsins and Iowas in the conference. With a convincing 10-point victory at Williams Arena, the Gophers proved that they can indeed play with the Big Ten’s elite. Thursday’s contest against the Buckeyes marked the second time in as many games that Minnesota faced a team ranked in the top 15. 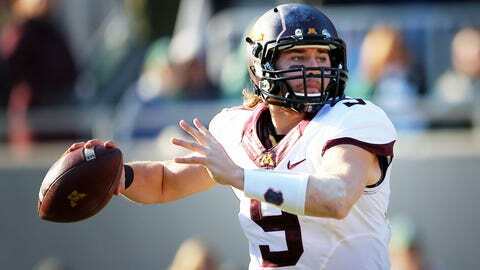 On Saturday, the Gophers let one slip away on the road against No. 5 Michigan State, losing in overtime. Even with the loss — which Minnesota refused to consider a moral victory — Pitino’s bunch hung tough with a Final-Four-caliber team in one of the tougher road venues in the Big Ten. It may be a bit early to tab Thursday’s victory as a signature win for Pitino, but it’s certainly a nice feather in his cap. "We’ve been in some battles already this year in Big Ten play," said point guard DeAndre Mathieu, who scored a team-high 13 points in the win. "We talked to each other after halftime and said, ‘We’re going to finish this time. This time we’ve got to finish this game.’ We let Michigan State go. We finally finished and it feels really, really good, man." 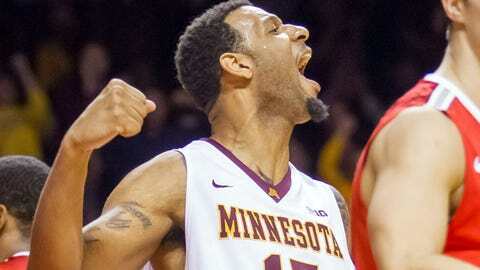 Mathieu was instrumental in helping Minnesota counteract the tough defense played by Ohio State’s guards. Entering Thursday’s game, the Gophers lauded Buckeyes senior Aaron Craft as one of the best defenders in all of college basketball. Fellow guard Shannon Scott also helped OSU limit opponents on the perimeter. That didn’t matter to Mathieu or the rest of Minnesota. The 5-foot-9 junior college transfer was fearless in attacking the rim, as he has been all year, and also added five assists for the Gophers. There was nothing Craft or the rest of the Buckeyes could do to stop him. "My family, people back home, they talk about (Craft) a lot. They were like, ‘This is your chance. This is who you’ve been waiting for all year.’ When I went home for Christmas break that’s all they talked about," Mathieu said. "I can’t wait to check my Twitter. I know they’re going crazy. Don’t tell Coach Pitino I said that, but I can’t wait to check my Twitter." For Craft and the Buckeyes, Thursday’s loss marked their third in a row after starting the year 15-0. Ohio State’s senior guard said nothing Minnesota did necessarily surprised the Buckeyes; they were simply outplayed. "They’re great players," Craft said. "It wasn’t anything that we didn’t know, which makes it worse. We knew what they wanted to do. We know what they want to try to do. They just out-toughed us." It’s the first time Craft has lost to Minnesota in his Buckeyes career. It was also the first time any player on this Gophers roster had experienced a win against Ohio State, as the last time came back in 2010. While Minnesota got a big contribution from Mathieu, center Elliott Eliason deserved perhaps the most credit. In his first game since being named a co-captain, Eliason scored 12 points and had 13 rebounds as the Gophers took advantage of Ohio State’s lack of interior defense. It was a sign of the growing confidence for Eliason during his junior year. In some ways, the same could be said for the entire Minnesota roster. "Confidence is so big in this game," Pitino said. "And he is certainly showing that when you play with that type of confidence, he feels he can play with anybody." The Gophers only have a brief moment to celebrate the win, as they now travel to Iowa to face a Hawkeyes team currently ranked 14th in the nation. After that, it’s back home to Williams Arena for a date with rival Wisconsin. Pitino also wouldn’t discredit Minnesota’s subsequent game at Nebraska on Jan. 26. The Big Ten is one of the best conferences in college basketball. On Thursday night, Minnesota showed it belongs in the Big Ten. "I think we competed really well," said Eliason. "We have two more opportunities to do it here against Iowa and Wisconsin. It’s awesome. It’s really awesome. I hope we get a little more respect."